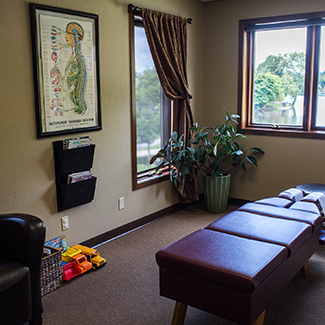 If you’re visiting our chiropractic care center for the first time, we’d like you to know exactly what to expect. We want to provide you with a meaningful experience and will make sure that you feel welcome and supported every step of the way. As you enter the clinic, you’ll notice that the atmosphere is light and bright, with a sign that proclaims, “Enter Here to Be Well.” Our office has been described as fun, energetic and welcoming. We hope that you feel the love here. If your condition is acute, the doctor will give you advice on home care. Your second visit will take about 30 minutes. During this appointment, the doctor will provide you with a report of findings, which is a full review of your evaluation results. Customized care options will then be suggested and a plan of action discussed to help you meet your goals. This will be followed by a gentle chiropractic adjustment, as well as therapy if it’s indicated. We’ll take you on a short tour of the clinic, and introduce you to some of the unique features of our office, including our expansive lending library. At the end of the visit, we’ll introduce you to Rhonda, who will help you review your financial options, as well as your scheduling needs. You’ll leave for the day with a smile! Subsequent appointments usually take no longer than 15 minutes. You’ll find that we’re passionate about the work we do. In addition to your chiropractic adjustment we will review and talk about beneficial lifestyle changes that will help you in your overall response to care.